I have a thing for pinecones. After Christmas, I always pick up a bag or two of those scented ones that are on clearance at that time of year. I’ve done this for a few years, so I have quite the pinecone stash. They are the perfect winter decor item to me. They fill my decorating desire after the Christmas stuff is packed up and stored away, yet I still want a little winter interest around the house. 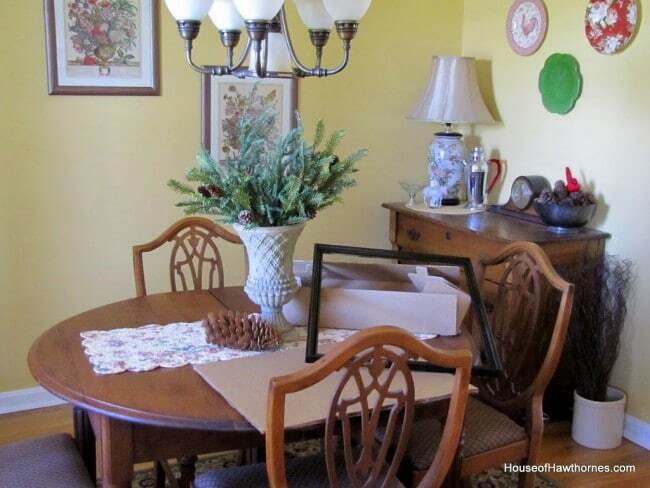 BTW, this was my dining room prior to the “photo shoot”. Blogging is all smoke and mirrors, people. 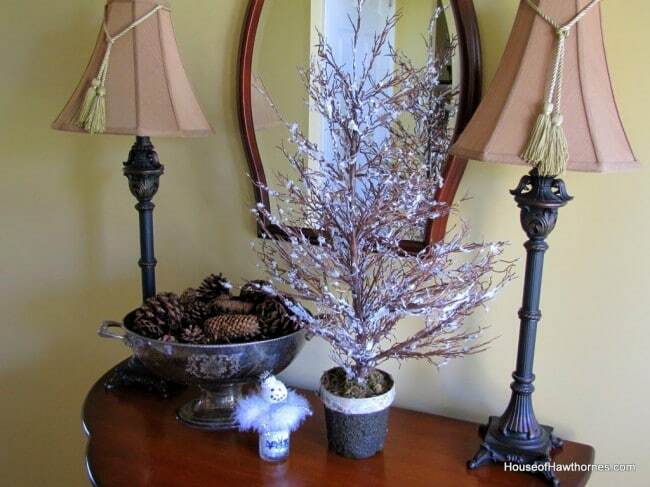 I bought this snowy tree at the Christmas clearance sales also. It is plastic with snow on it, so there was no way I way going to pay full price for it. But for the clearance price of $5.00, it wasn’t looking so bad. 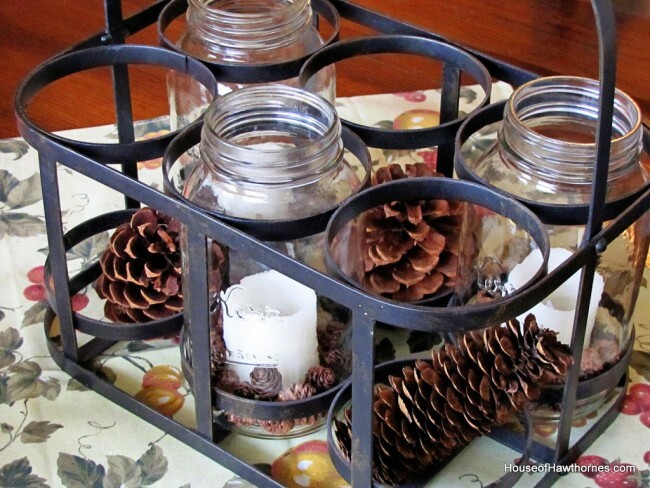 I incorporated pinecones into my mason jar/wine bottle holder on my kitchen table. Here’s another nugget of reality. Just out of view of the last two shots was my son’s Spongebob Chia Pet that has been living on my kitchen table since Christmas day. If you run to Kmart, you may still be able to find one for yourself! Now, I also have baskets of pincones on the back of the toilets in two of my bathrooms, but I draw the line at toilet photos. A girl’s gotta keep something to herself. 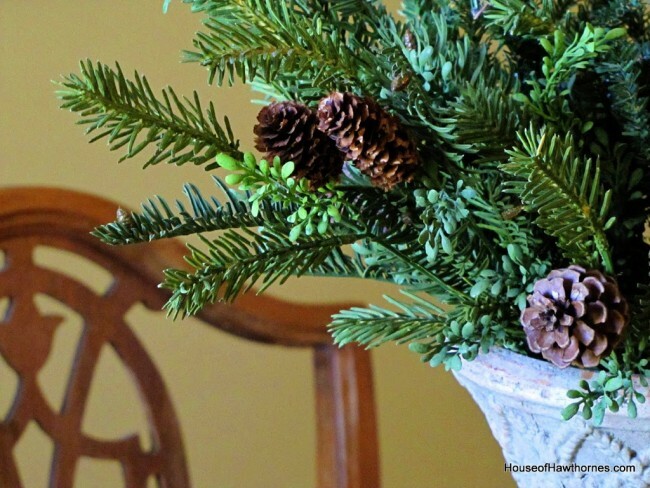 Did you decorate for winter or have you moved on to spring already? Linking with A Stroll Thru Life‘s Table Top Tuesday. I have a thing for pinecones. Love your vignettes. I actually made my husband stop the car this weekend when we were up north so that I could take a picture of a pine swag that was on somebody’s house. It was loaded with pinecones. But pu-leese. Have I decorated for winter or skipped over to spring? Ha! I still have some Christmas things out that haven’t been put up. And I didn’t even decorate much! At all. Pam I love adding pine cones around too. I LOVE your table and chairs and that little buffet!! 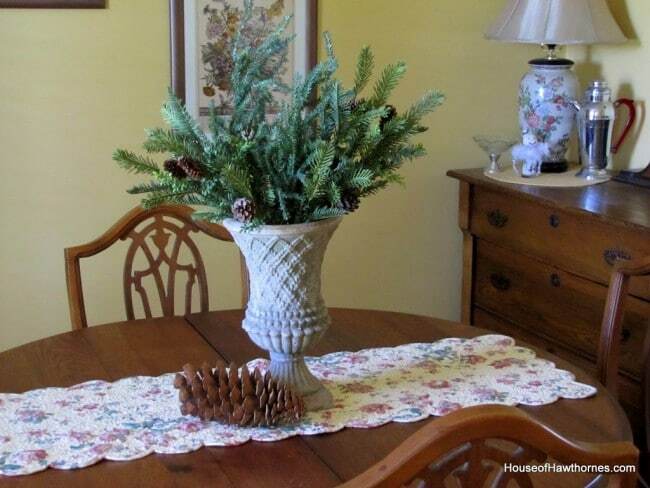 Very pretty vignette on your hall table. 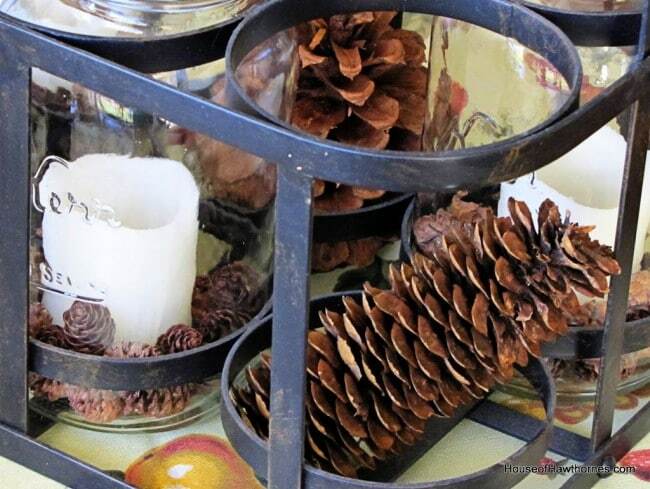 I love pinecones, too, and am so fortunate that I can step out my back door and gather a basketful when I want. I like the way yours look in the silver bowl. It’s hot here most of the year, so I’m enjoying winter while I can!!! They are a perfect winter touch to any decor Pam. I have so many in our yard that I do not need to buy them..however the scented ones are awesome! They last awhile too, as I have bought a bag or two that I wanted the smell and that nice pine cone look. Your look so pretty. Cute vignettes! 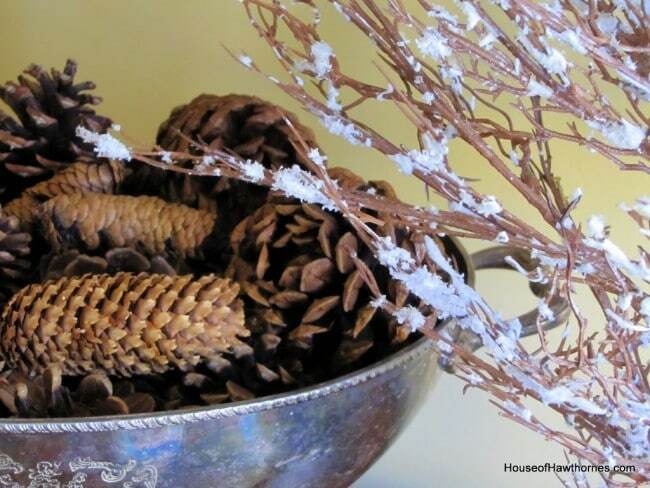 Pinecones add to a winterscape!! I’m lucky I can step outside and gather all the cones I want!! I’m a pinecone girl too, Pam. I keep winter out until March and it’s mainly to have the pinecones out. I have two quilts with pinecones, pinecone candles, as well as the real thing. I’m jealous of you gals that have them in your yard…lucky!! I do not like the stinky cinnamon smelling ones ! too odoriferous for my gentle nose…. In my haste to get rid of Xmas decor, I even packed up the pine ones. Not that I am in the mood for creating right now! can u say apathy? LOL. Honey Bunches of Oats, I can send you oh about a hundred pine cones easily. We have two million in the yard. Joe is repairing two vintage lamps with pine cones on them right now. The wine crate with jars and cones is lovely on the table. The chia is cute. I have never had one. Not spring…but I am getting ready to do Valentine’s day! I like pine cones too!! Spring won’t be around here until mid-March. So, I’m enjoying the return to simplicity after Xmas. But I’ll put up some decorations for Valentine’s. Me too. 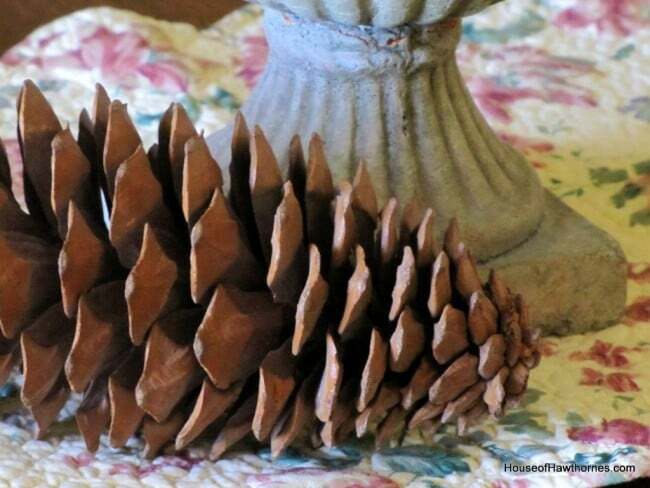 LOVE pinecones. Have them scattered about my house too. Your $5 tree is some find. Looks GREAT. Really like it. Never can find neat stuff around here on sale. Sigh! 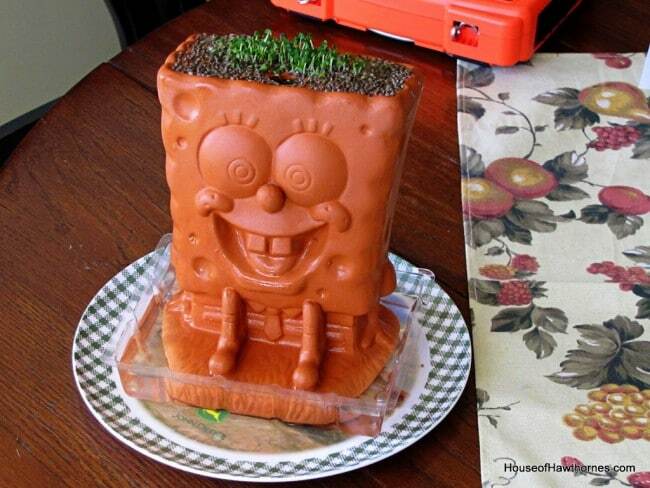 I haven’t seen a Chia Pet in years. Sponge Bob looks like he’s sprouting a head of hair. PS I have a toilet shot on my blog. Sometimes you just have to show them. LOL Take care. I love the “smoke and mirrors” phrase. than we do in taking the the picture. Too funny. 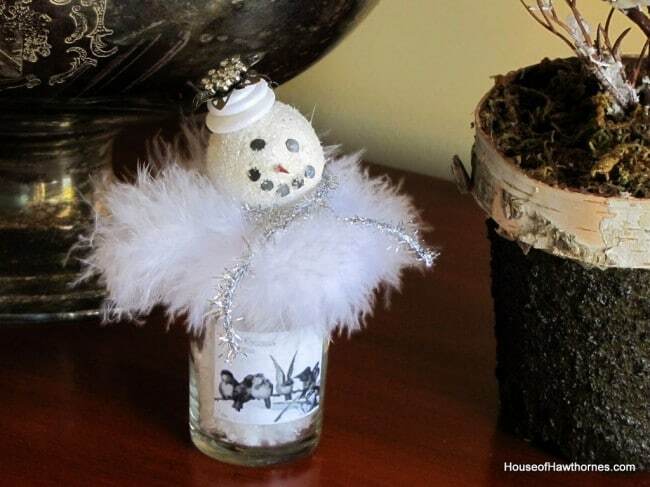 I am still working on the winter decor. I find myself picking up pinecones along my travels. My biggest one is from when I stayed at Andy Griffiths childhood home. Now all the sudden my evergreen tree has pinecones, after living here 16 years? I think I saw a peek of some in an aluminum bowl? hhmm may do that myself. I have a thing for pine cones too, and just found a bag full yesterday while cleaning my laundry room. I swear we are twins from another mother or something. I want your bottle holder!!! Love your dining room and yeah blogging is all smoke and glass isn’t it?? You should see my table…laptop…grocery bags…backpack etc etc! Sam would love that spongebob thingy! !